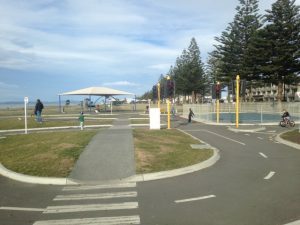 This is a huge completely fenced playground with something for all ages with a separate but equally good, fenced, mini road system bike track on the other side of a small carpark but linked via the walkway on the sea side. 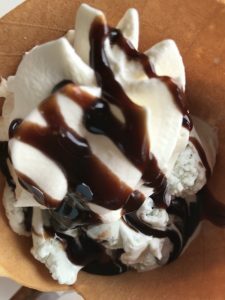 Both are right on the sea front, within walking distance from the city centre and there’s even a great ice cream stall and coffee cart just outside the fence. There are toilets and parking if you’re not able to walk/scoot along the promenade. The playground has every piece of equipment imaginable from a circle of swings that swing in so kids can try and reach each others’ feet, to a huge set of rock climbing boulders, monkey bars, skateboard sliders and various obstacle courses. The whole playground is fenced and gated but within this are further gated sections including one for up to 7 year olds. 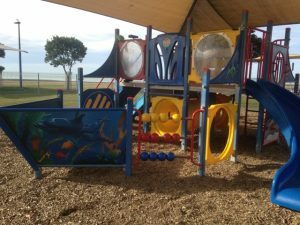 This includes sand play equipment, a pirate ship shaped climbing and sliding structure and swings. There are lots of shade sails around the playground although not all the equipment is covered. The Junior Bike Track is just across the carpark from the playground and has proper working traffic lights, stop signs, roundabouts etc. It’s also fenced and provides a safe place for kids to learn to ride their bikes or scooters and try to understand the rules of the road. Within the fence, there’s a separate fenced area specifically for under 3s to practise and have fun. Some parts of the bike track are under shade sails. If the weather suddenly turns nasty and you need to be inside quickly, the National Aquarium is about 500 metres down the road and linked via the walkway on the sea-side of the playground and bike track. For more activities along the walkway, see here. Address: Marine Parade, opposite Edwardes Street with a small car park just past the playground if heading away from Napier.